Family road trip! 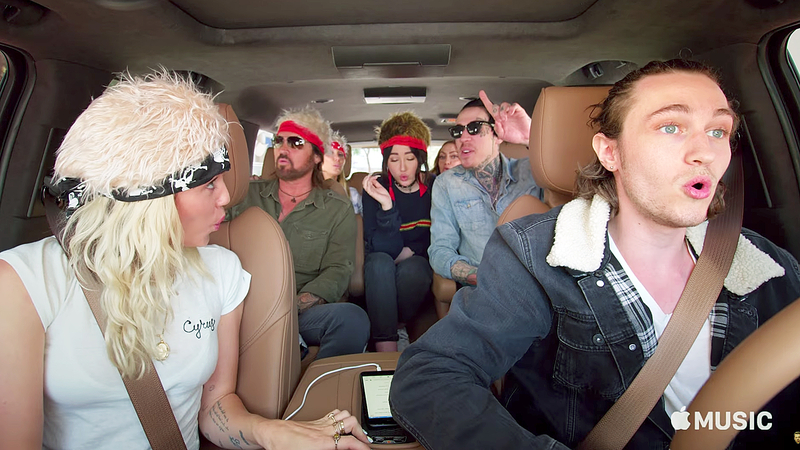 Miley Cyrus and her family cram into an SUV and have a sing-along in a preview for the Tuesday, August 29, episode of Apple Music’s Carpool Karaoke. In the clip, the “Malibu” singer, 24, rides shotgun while her brother Braison drives. Miley’s dad, Billy Ray Cyrus, and brother Trace take the middle seats, and her mom, Tish Cyrus, and sisters Noah and Brandi pile into the back. The group jams out to Billy Ray’s 1992 hit “Achy Breaky Heart,” while the country singer urges the car’s DJ to turn it up “a little louder, a little louder.” The family of seven even get into costume and put on mullet wigs and bandanas for a true country feel. Miley, who is wearing grillz and a white T-shirt embroidered with her last name, lets 17-year-old Noah take the lead. The up-and-coming pop singer gets super into the song and belts out the lyrics the loudest. Meanwhile, Miley dances in her seat, but seems to have trouble singing until she pops out her grillz for a verse. The cameras then flash to a billboard of the Cyrus crew. In the photo, Miley dons a giant pink hat and holds a pink guitar, Billy Ray wears boxing gloves and looks tough for the camera and the rest of the family hold various funky props. The full episode of Carpool Karaoke: The Series premieres on Apple Music on Tuesday, August 29 at 9 p.m. ET/6 p.m. ET.